Today is a fun day because the Avery Elle design team is teaming up with our friends over at CardMaker Magazine for a fun blog hop. Be sure to stop by our company and designer blogs to be inspired and enter for a chance to win a prize. One lucky commenter will be drawn at random and will win a $30 Avery Elle Gift Certificate. You have all week to enter to win. The winner of the Avery Elle Gift Certificate will be announced on the Avery Elle blog on Monday, June 29th. I started by partially die cutting the seal tail and then used the wavy die to create the top of the water. I love how you can just turn the seal and he looks like he's diving:) I colored the seal with some Copics and then used the dotty stamp from Swim Team to give him spots on his belly. I added a little more detail with the wave die cuts in the water. I finished it off with one of my favorite sentiments. The next stop on the hop is the lovely Patti Gilliam, but here's the full list if you've just jumped in! Your card is so cute. I really like the darker blue shade you used for the ocean. it really makes it look like the deep ocean. Wow JJ, this card is amazing! I love the coloring and that awesome partial die cutting you did around the image! Super card -- I love the sun! Very unique !! I think partial die cutting is so fun!! Thanks for sharing. This is wonderful! I love partial cutting, and this is a great way to use it! Cuteness in measures of oodles!!! Awesome card! I love that sweet seal!! I love the effect made by the wave die in the water. Oh how fun this card is! Great card & technique to make the seal partially out of the water. What a fun and fabulous card- love the partial die cut technique and those added little wave die cuts at the bottom- such a great card! you create a beautiful scene! 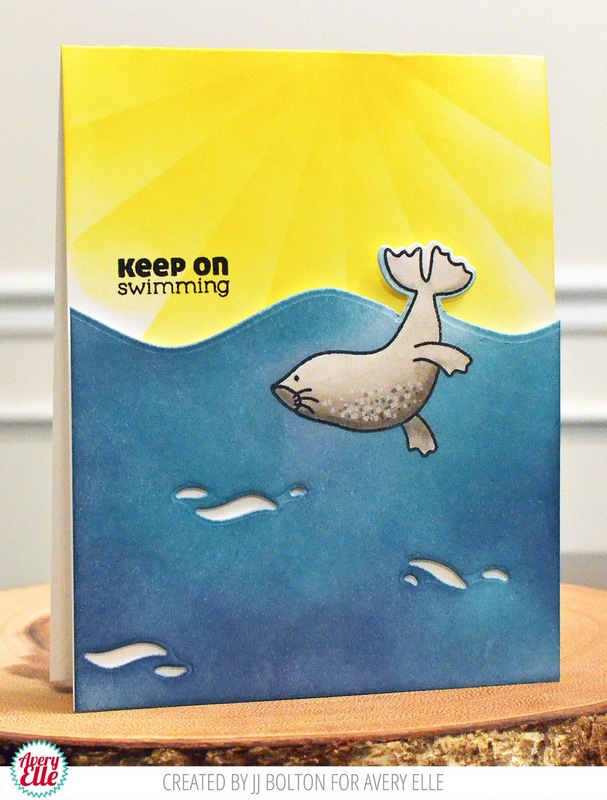 Love this seal and the card you've created. The dots on his tummy are the best! What a fun card! Love the little spots on the belly and how you created the rays of sun! FAbulous scene for this seal. Such a creative way to design your adorable card by doing a partial die cut. This is a super cute card. The sun looks amazing as the background and the contrast to the ocean is fantastic!! Awesome, awesome job! I loved the cute seal and the wave effect you made! what a cool card! Great ocean scene! Love the seal! What fantastic die cutting effects! Nice shading of the water, great detail on the seal & the partial die cutting is a fantastic touch!!! Wonderful card! Your shading is really lovely! Really nice card ! I really love your sky ! Love the card!! So encouraging. Your background is amazing!! Love this card--great color and so cheerful too! I've got to try cutting with the partial die. Super cute card! Awesome colors on your pretty card! Love how you created the sun! So adorable!!! Love your coloring on that sweet critter! Love the inking and the dot texture on the whale! What a cute encouragement card! It made me smile! Your card is so perfect! I've seen that stamp a lot, but never turned downward like that. I love it! The water is just so perfect. I am loving all the sea life coming out. Thanks so much for sharing. Oh my goodness...this is absolutely darling, JJ! I love that you did partial die cutting and your coloring is amazing! Love it to pieces! what a fun card. Love the sun beating down from the top of the card. The water with the cutouts is a nice. The seal looks so happy. Such a cute card! This little seal is adorable! BEAUTIFUL and so AMAZINGLY done!! So impressive and such a wonderful scene!! You have just knocked me off my feet with this card!! !